Design creativity and the highest quality of product. 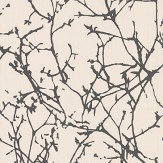 Inspired by a 1950’s Scandinavian block print, this wallpaper shows flowers and large leaves. 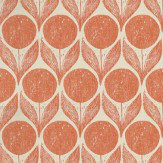 Shown here in blossom clementine and taupe. Other colourways are available. Please request a sample for a true colour match. Pattern repeat is 34.3cm. 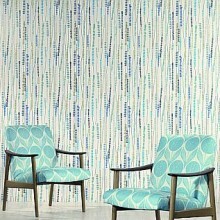 Inspired by a Matisse cut-out, this fresh stylised trail is printed in contemporary colour combinations. Shown here in white, orange and charcoal grey on a light grey background. Other colourways are available. Please request a sample for a true colour match. 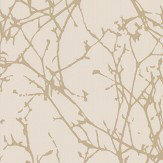 A striking and stylish design of tree branches in a metallic ink like finish on a matt background. Shown here in bronze on charcoal grey. Other colour ways are available. Please request a sample for true colour match. A wide width and paste the wall product. 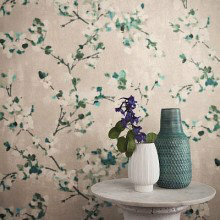 An all over attractive trailing floral design in silhouette shown in a metallic textured effect on a matt background. 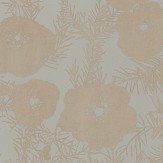 Shown here in a bronze/gold textured metallic on grey. Other colour ways available. Please request a sample for true colour match. A wide width and paste the wall product. 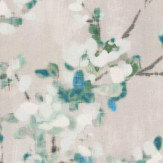 A pretty trailing floral design of Japanese style blossoms in a water colour soft focus effect on a lustre effect ground. Shown here in the peacock colour way. Other colour available. Please request a sample for true colour match. A wide width and paste the wall product. 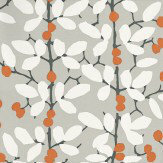 A hand-drawn tree design printed in bright, contemporary shades and neutrals with metallic accents. Shown here in Lovat grey, duck egg blue and white with metallic detailing. Other colourways are available. Please request a sample for a true colour match. A bead effect design printed using the gravure technique. 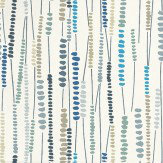 Shown here in various shades of blue and taupe on a off white background. Other colourways are available. Please request a sample for a true colour match. 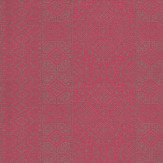 An intricate Moorish design beautifully printed in soft metallic tones on coloured grounds. Shown here in Rosa pink. Other colourways are available. Please request a sample for a true colour match. Pattern repeat is 26cm. 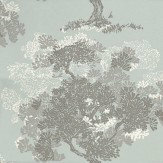 A hand-drawn tree design printed in bright, contemporary shades and neutrals with metallic accents. 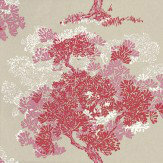 Shown here in Begonia pink, red and white with a metallic taupe background. Other colourways are available. Please request a sample for a true colour match. 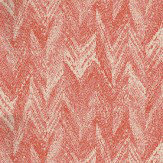 A chevron design with an irregular organic nature. Shown here in saffron. Other colourways are available. Please request a sample for a true colour match. Pattern repeat is 36cm. 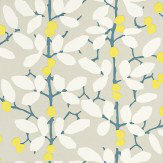 Inspired by a 1950’s Scandinavian block print, this wallpaper shows flowers and large leaves. Shown here in black and white. Other colourways are available. Please request a sample for a true colour match. Pattern repeat is 34.3cm. 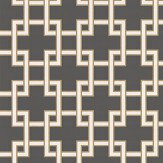 A smart geometric design of squares linked together forming a contemporary trellis. Shown here in cream with a gold glitter metallic ink on black. Other colour way available. Please request a sample for true colour match. A wide width and paste the wall product. Actual pattern repeat 12.8cm. 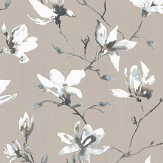 A beautiful, delicate winding floral trail of magnolias shown here in white and eau de nil on a metallic silvery background. Other colour ways available. Please request a sample for true colour match. A wide width and paste the wall product. A large smart contemporary diamond trellis design. 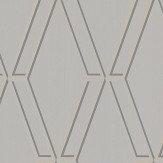 Shown here in silver metallic ink on grey. Other colour ways are available. Please request a sample for true colour match. A wide width and paste the wall product. 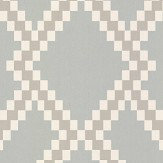 Inspired by a Matisse cut-out, this fresh stylised trail is printed in contemporary colour combinations. Shown here in white, teal and yellow on a grey background. Other colourways are available. Please request a sample for a true colour match. 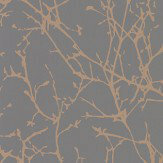 A striking and stylish design of tree branches in a metallic ink like finish on a matt background. Shown here in gold on cream. Other colour ways are available. Please request a sample for true colour match. A wide width and paste the wall product. 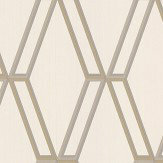 A large smart contemporary diamond trellis design. Shown here in silver and gold metallic ink on white. Other colour ways are available. Please request a sample for true colour match. A wide width and paste the wall product. 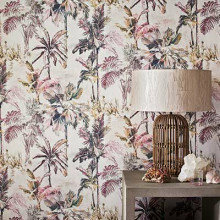 Inspired by tropical scenery with exotic leaves, grasses and textural designs in a range of fashion-led colours. 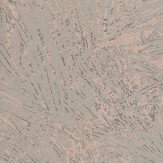 The use of pearl and metallic print effects throughout give this collection an added lustre and will reflect light around your room. 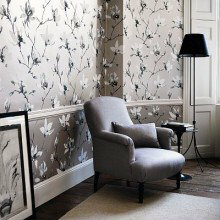 A pretty collection of delicate florals and subtle geometrics with an Oriental feel. 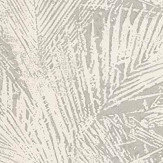 Beautiful metallic inks highlight these designs with a mix of vinyl and paper backgrounds in a range of sophisticated colours, neutral shades of greys and charcoal tones with blush pinks and chalky blues. A sophisticated palette of greys and neutrals give this beautiful collection of designs a contemporary feel. 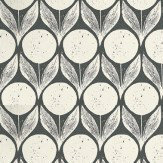 Subtle metallic inks, lustre effects and beads combined with floral and geometric designs, to create a stylish atmosphere in any room. From the simplicity of Scandinavian block prints to the complexity of vintage Moroccan textiles this collection takes a broad range of inspirations and unites them with a vibrant, retro colour palette. 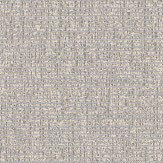 Shown in the image is the delightful beaded curtain inspired Pintura design. The use of paste the wall product makes this collection easy to use as well.